For all the involvement of the FSB—a KGB successor organization—in Russia’s state-run doping operation, the main scheme was breathtakingly simple. Moscow’s World Anti-Doping Agency-accredited laboratory would report positive tests for PEDs to the Russian Deputy Minister of Sport, who would then decide which of those positives to report as negatives. It didn’t involve masking agents, vials of clean blood, or anything so complicated. It didn’t have to. All that had to happen was that a well-placed person had to say a failure wasn’t a failure. Further evidence of the Disappearing Positive Methodology was discovered through the IP’s investigation into samples taken during the second half of 2014. On 07 December 2014, WADA wrote to Dr. Rodchenkov to advise him of a surprise inspection of the Moscow Laboratory. It was communicated to him that this visit would also involve removing samples held by the Laboratory and that he was to secure the stored samples in advance of WADA’s arrival. An impotent international agency funded by those it’s tasked with policing will always be able to make calls for this and that, just as an autocratic regime will always be able to find—or force—somebody to take the fall. That a fall is there to be taken comes down, comically, to WADA finally having done what it purportedly exists to do, five years late and in the face of immense public pressure, and then only because it has failed at its true purpose, which is providing a plausible PR cover for the cynical acts of various interested institutions. Anti-doping efforts stem from the fundamentally unworkable premise that there are some things athletes should be allowed to put in their body and some things they should not; that some things are “natural” and others “unnatural.” No matter where you decide to draw that line, it is an ultimately arbitrary divide. For decades, the PED fights in sport has been waged around this divide: Agencies like WADA increase the amount of substances on the banned list and develop better methods for testing for those substances; doping athletes (and, perhaps, allied intelligence agencies) find new drugs and new methods for masking their tainted blood or urine; and everyone who wants to or has an interest in believing that the system works demonstratively pretends that it does. 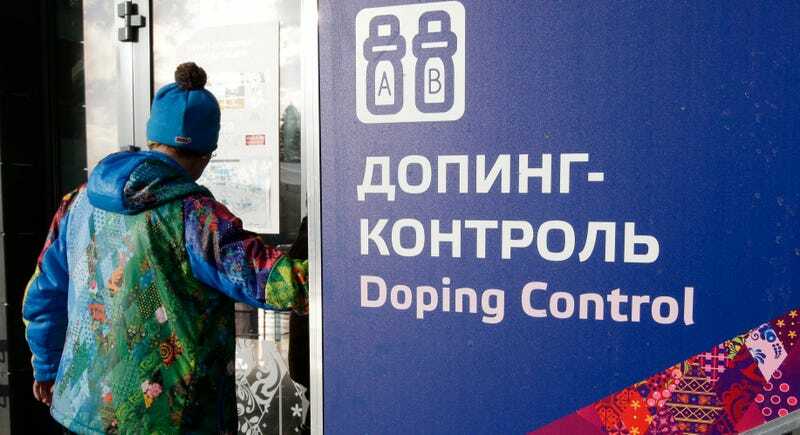 Russia’s crime here is to have skipped the cat-and-mouse game completely and hijacked one of the 35 or so laboratories accredited by WADA to test athletes. When they couldn’t, they broke into the Olympics sample collection room. Anti-doping procedures, it turns out, are even more futile and easier to subvert than you thought they were. They just involve getting thugs to pick locks and authorities to throw inconvenient results in the trash. Thirty years after genuinely horrifying revelations about the systemic doping of Eastern Bloc athletes who in many cases didn’t know they were being doped, we are no closer to “clean” competition than we were then. And with the vast majority of dopers being caught only after they compete, we’re fast approaching a reality in international competition —already present in boxing and the UFC—where the immediate thrill of victory is diminished by the questioning about whether the victory will stand, not unlike the havoc that replay is wreaking on sports. I don’t know if a pharmaceutical free-for-all is a better solution, but the current anti-doping regime is an enormous failure—at best a massive exercise in ineptitude, at worst a cynical public relations exercise. The solution isn’t to tweak, change, or modify it but to reimagine, from the ground up, what we want sports to look like. When that was last attempted, in 1999, we ended up with WADA, which—if you give it credit for good intentions it probably doesn’t deserve—was founded with the aim of standardizing doping controls and ended up a powerful tool of Russian intelligence. That’s a worse outcome than the old, corrupt system of anti-doping ever could have produced, but perhaps a better one than the next set of good intentions would. Leaving it all alone doesn’t seem like a great idea; is it really worse than the alternatives?